At a recent conference, I met a fellow entrepreneurial writer I’ve known online for many years. She and her husband attended the microbusiness workshop I did, then stopped by the booth to talk about current projects, managing a business, and getting it all done while caregiving for an elderly parent. She’s doing that now, and I did it for about 18 years, and it’s not easy. It’s amazing how much can be done, though. After the conference, she e-mailed me the question she couldn’t think of while we were talking, and after answering, I asked her permission to share it here. I have a feeling that many other entrepreneurs face similar circumstances, and might find it helpful. It was how do you budget your time? See body of the article and linked posts below. If you write once a week for your blog — how long does it take you? A: I allow a full day for creating a post, its graphic, links that go with it, and the social media posts about it. And with needing to go and leave messages at other blogs, and linking to them on your own — how much time does this take? A: I allow about a half hour about three to five mornings a week while finishing my coffee to scan other blogs and check social media. I don’t want to get sucked into the Abyss of Squandered Time, so I’m pretty strict as to when I quit scanning and go to work. Do you have a certain amount of hours that you reserve for this, or . . . ? A: If you already have a list of blogs and people you follow, it can be a fairly quick process (see above). If you’re just beginning to do this purposefully, spend a day or so finding interesting sources and creating a list that you can easily check and read. Administrate (answering customer e-mails, paperwork, invoicing, and all the stuff I’m rather bad at). I try to designate all the hours before lunch as Create time; at least two hours in the afternoon as Communicate time; and the rest for Admin. If Create is going well, I’ll let it go on, and if a blog post is running long, I will bump Admin to the next day. Social media is 15-30 minutes a day unless there’s something special going on. I keep the blogs I want to follow bookmarked in a list so I can scan them quickly and decide what to read/comment on. I preschedule many tweets using Hootsuite, and add others — retweets and replies — as needed. I’m like you — I do the next thing, and prefer a routine to a schedule. So except for the 30 minutes allotted to checking my blog list (above), my morning hours are reserved for activities in the Create category. Ideally, I don’t check e-mail, spend extra time with blogs or social media, or do anything until I’ve completed the most important creative task of the day. After lunch and a short break, it’s on to Communication. If I need to write a blog post, I do it before checking e-mail, as e-mail tends to be an endless rabbit trail. Finally, in the pitiful fragments that remain, I either do or postpone the Admin tasks;-). For me, that’s the only way I can get anything done. 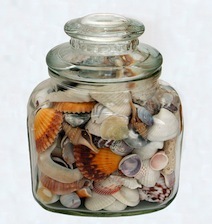 Remember that analogy of rocks, marbles, and sand in a jar? Put in the big rocks first, add marbles, then sift sand in. You can fit in more than if you put in sand first, marbles next and then try to shove in a big rock or two. It has worked for years when I apply it (aye, that’s the rub!). Finally, all the time management techniques in the world can’t eliminate schedule disruptions and other surprises, but if you prioritize and follow a simple time management system, you will will have a greater chance of meeting your goals than if you just do the things that seem most urgent at the moment. As Stephen Covey suggests in The 7 Habits of Highly Effective People , begin with the end in mind, and focus on things of lasting value. You may not get it all done, but you can get more done than you ever imagined! Note: As always, Amazon links are affiliate link; full information in the footer of all the pages at this site.